Gallery Wendi Norris is pleased to present Subverting Solidity, the gallery’s second solo exhibition for Vienna-based artist Eva Schlegel. 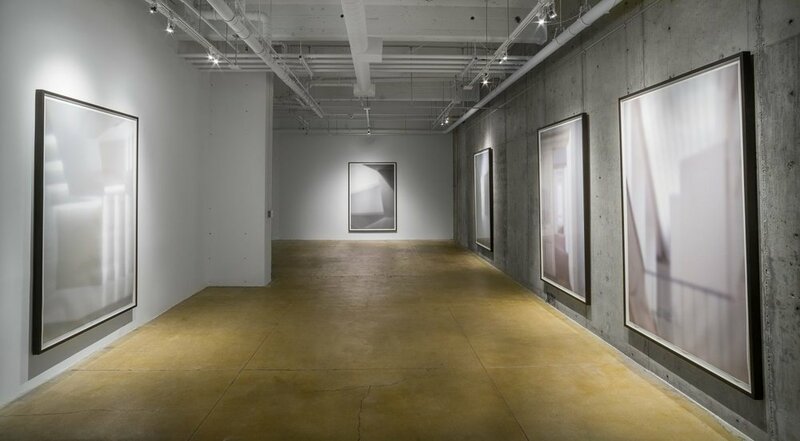 Schlegel’s new large and mid-scaled photographs depict the abstraction of architectural space. Minimal and ethereal, set mostly in tones of white, gray and black, these 17 images float the eye through physical environments in ways impossible in real time and space. By denying the eye the hard line rationality of familiar architecture and the grounding effect of gravity, these photographs free the viewer from a building’s intended function, permit the imagination to roam and encourage the mind to reimagine the experience of place. This new body of work, part of the artist’s continuing series of blurred spaces, asks the viewer to reconsider the role that architecture plays in society and in one’s psyche. An extension of the artist’s larger than life blurred women series, this body of work forces the viewer to confront architecture as a set of constraints that program human activity. The works reposition hallways, walls, corners, beams, and portals through an abstract lens in order to interrogate how the establishment of architectural space is designed to affect and govern physical actions, and thereby to influence the construction of one’s persona. Similar to how blurred women asks us to consider the stability and construction of one’s identity, blurred spaces asks the viewer to think about the effects of subverting the solidity and rationality of architectural space. Fracturing, faceting, and abstracting architecture recurs as a theme in Schlegel’s permanent interventions as well, such as in No Man’s Space , a monumental series of mirrors on truss structures at the Voestalpine Open Space above the OÖ Kulturquartier in Linz, Austria. This architecturally scaled installation enables the viewer to experience a maze of angular fragments of steel, glass, sky and space. In this work, the artist physically manipulates the experience of real space and time, by fracturing and interrupting the viewer’s gaze. Due to their angulations, at no time is the viewer able to see their own reflection in the multitude of mirrors, yet through strategic placements, the sky comes to the ground and walls become windows. The function is to establish a system of movement through space that is free from the confines of rationality. On February 2 from 7-8 pm, inspired by the architectural images and cosmic films of Eva Schlegel, exhibition programming continues with Unbuilding; a one hour series of experimental short 16mm films about the abstraction of the built environment. Using depictions of the city as a metaphor for the self and of the community, these works of art take us on a trip around the globe to investigate the complex, multidimensional and often fractured feeling of our urban spaces. Curated in collaboration with local filmmaker Paul Clipson, doors open 6:30pm with the film program beginning at 7:00. Selection highlights include Lighthouse, 2015, by Paul Clipson (5:25 minutes), Visions of a City, 1978, by Lawrence Jordan (6:16 minutes) and Shibuya – Tokyo, 2010, by Tominari Nishikawa (10 minutes).